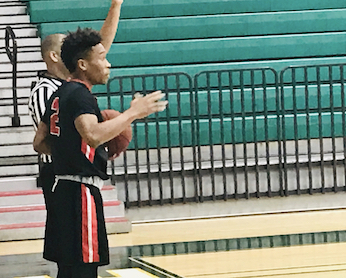 EL CAJON (12-2-2018) – San Diego City College sophomore guard Joseph Riley is known as a streak shooter. On Saturday (Dec. 1), such shooting was officially on Red Alert. Riley drained eight shots from beyond the arc in the first half alone, lifting the Knights to a 20-point lead at the intermission en route to a 93-82 thrashing of Moorpark at the second round of the 47th annual Grossmont College Invitational. Riley finished with 29 points, including 24 in the first half, as City totaled a season-best 59 points by the break. Knights teammate Robby Robinson posted a double-double with 17 points and 11 rebounds for the Knights (7-5) Raiders fell to 5-4. Riley broke an early 6-all tie with his initial triple, then sank two additional bombs to cap a 12-2 run to make it 18-6 five minutes into the contest. Four minutes later, Riley sank three straight triples for a 35-20 cushion, And when Riley hit two more from downtown, the lead jumped to 44-22 and 47-24. For City, No. 24 added 15 points, while Kai Huntsberry had 11 from off the bench. Moorpark received 35 points from Brandon Russell, but most of it was cosmetic coming after the contest was long decided. San Diego City meets Cerritos in Sunday’s championship. Cerritos 63, Palomar 45: The Falcons of Norwalk entered the Grossmont Invitational with a chip on its shoulder. Seeking to become the state’s top-ranked team, Cerritos was unbeaten until falling to Fullerton, 68-61, prior to heading south for the tournament. And they’re taking out their frustrations on San DiegoCounty-basedd teams. Following a 38-point victory over the hosts in the first round, Cerritos also did a number on Palomar, handing the Comets their biggest setback of the season in Saturday’s (Dec. 1) easy 63-45 decision over the Comets. Cerritos, which forced 24 Palomar turnovers to forge the victory, broke a 21-all halftime deadlock by running out the Comets (3-5) by a 42-24 margin in the second half. The Falcons (6-1) will meet San Diego City in Sunday’s championship game. In the other Grossmont Tournament action, College of the Desert topped L.A. Southwest, 74-71. Victory Valley 87, Southwestern 83: Less than 25 hours after upending the tournament host Owls, the Jaguars slipped and fumbled away a 10-point halftime to in losing to the Rams at the Citrus College Invitational in Glendora. Nathaniel Pearson (Hoover HS) tallied a game-high 29 points for Southwestern (8-3), including 19 on 7-for-8 shooting in the first half. However, when two starters fouled out, Victor Valley (4-5) took advantage of a Jaguars bench which played great in the opening round yet did little for an encore. Southwestern, which saw its 5-game winning streak snapped, next hosts its own tournament starting Friday, meeting Barstow in the first round at 7 p.m.
Ventura 74, MiraCosta 58: The Pirates downed the Spartans at the Antelope Valley Tournament in Lancaster. No information was supplied by the tournament hosts. Imperial Valley – Mt. San Antonio: The Arabs meet the host Mounties at the Mt. San Antonio College Tournament in Walnut. IVC enters on a 5-game losing streak.